The intricacies and challenges of musical performance have recently attracted the attention of writers and scholars to a greater extent than ever before. Research into the performer's experience has begun to explore such areas as practice techniques, performance anxiety and memorization, as well as many other professional issues. 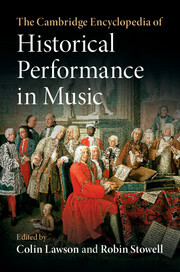 Historical performance practice has been the subject of lively debate way beyond academic circles, mirroring its high profile in the recording studio and the concert hall. 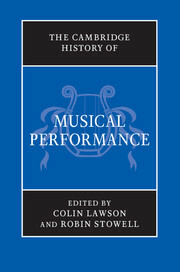 Reflecting the strong ongoing interest in the role of performers and performance, this History brings together research from leading scholars and historians and, importantly, features contributions from accomplished performers, whose practical experiences give the volume a unique vitality. 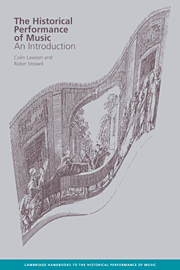 Moving the focus away from the composers and onto the musicians responsible for bringing the music to life, the History presents a fresh, integrated and innovative perspective on performance history and practice, from the earliest times to today. "This book, which is longer than the latest Stephen King novel, might seem too large for a thumbnail review, but the subject it attempts to cover is so huge and comprehensive that a review 10 times the length would probably not so it justice." "This compilation, with its large number of authors, exhibits differences in style, tone, organization of material, and approach to subject, but overall it hangs together in a remarkably cohesive whole." 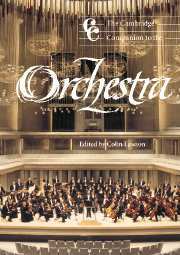 Colin Lawson is Director of the Royal College of Music, London. He has an international profile as a period clarinettist and has played principal in most of Britain's leading period orchestras, notably The Hanover Band, the English Concert and the London Classical Players, with whom he has recorded extensively and toured world-wide. Described by Westdeutsche Allgemeine Zeitung as 'a brilliant, absolutely world-class player' he has appeared as a soloist in many international venues, including London's major concert halls and New York's Lincoln Center and Carnegie Hall. His recent discography includes two volumes of sonatas by Lefèvre in their original scoring for C clarinet and cello. 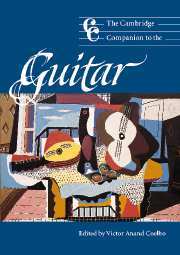 Colin has published widely, especially for Cambridge University Press. 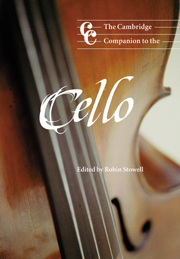 With Robin Stowell, he is co-editor of a series of Cambridge handbooks to the historical performance of music, for which he co-authored an introductory volume and contributed a book on the early clarinet. Robin Stowell is Professor of Music and Director of the Centre for Research into Historically Informed Performance at Cardiff University. Educated at the University of Cambridge and the Royal Academy of Music, he is also a violinist/period violinist and has performed, broadcast and recorded with The Academy of Ancient Music and other period-ensembles. 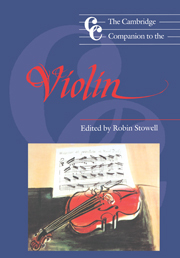 Since his pioneering book Violin Technique and Performance Practice in the Late Eighteenth and Early Nineteenth Centuries (1985) he has published widely on issues of performance practice, organology, music of the 'long eighteenth century', violinists, chamber music and string playing in general. 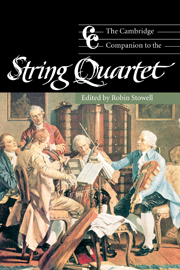 His more recent major publications include The Cambridge Companion to the String Quartet (2003), The Early Violin and Viola (2001), a monograph on Beethoven's Violin Concerto (1998) and a co-authored volume (with Colin Lawson) on historical performance (1999), the first of a series of which he is co-editor.